That Twitter has been expanding well outside the borders of the United States is well known. It’s becoming a global social media phenomenon and much of its growth is currently coming from this international expansion. 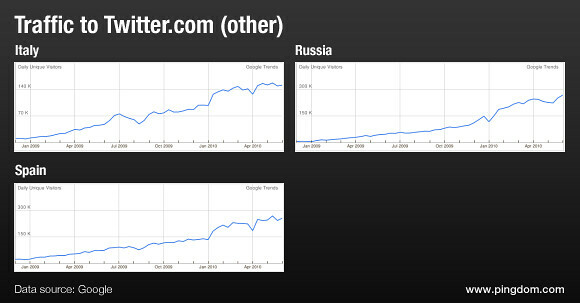 We thought it would be interesting to investigate where Twitter is growing the fastest right now. 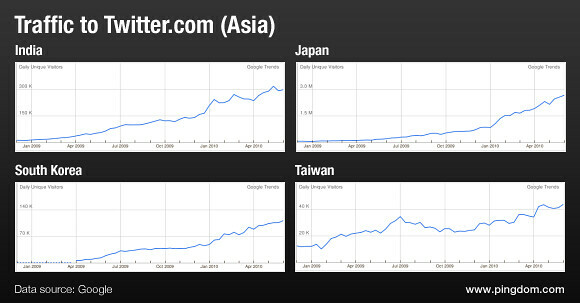 By looking at traffic data to Twitter.com, we’ve identified several countries where Twitter is currently growing rapidly (this year). These are not necessarily countries that have a ton of Twitter users yet, but rather places where the traffic curve is pointing sharply upwards. Above: The graphs show traffic to Twitter.com through 2009 until now. These are not small countries. Together, they have almost 150 million Internet users that Twitter can potentially tap into. For perspective, there are 234 million Internet users in the United States. A second area where Twitter seems to be getting a boost is in Asia, especially in East Asia, accounting for three out of the four countries we list here below. That is roughly the equivalent of the number of Internet users in the United States. Twitter is also getting increasing amounts of traffic from other parts of Asia, such as Thailand, the Philippines, Malaysia, Indonesia, and so on. These three countries have 104 million Internet users between them (Russia alone has 45 million). And there are many other countries where Twitter is growing (most European countries, for example). We simply cherry picked the ones where this year’s traffic increase to Twitter.com is extra sharp. 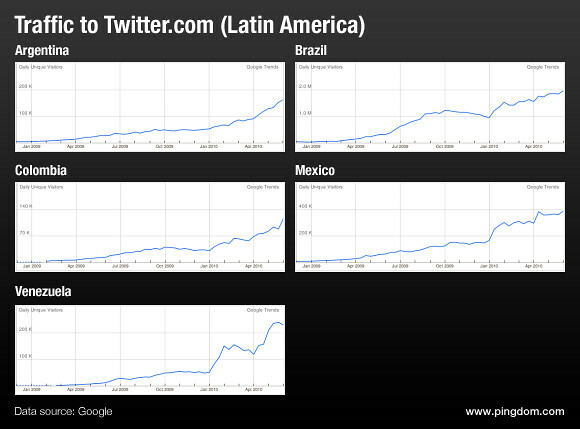 Growing internationally is important if Twitter wants to become the pulse of the web. The United States may be big, but it’s worth remembering that the country only accounts for 13% of the world’s Internet users. Another fascinating aspect here is language. So far, the dominant language on Twitter has been English. However, with the exception of India, none of these countries are big on using English. This means that the number of non-English tweets will increase significantly in the coming year(s). This is of course an inevitable consequence of Twitter going global, but it will be interesting to see how Twitter and its users adapt. Data sources: Google Trends for Websites for traffic data, Internet World Stats for Internet user numbers. I wish you can post a article about twitter technology info, the same way you wrote about facebook, awesome article, thanks a lot. Look forward to see twitter details. Thanks! Paypal growing like crazy... because of external developers?